Yup, your top three favorite and most popular blog sites namely Rhythm of the Rock, Rockz Cafe, and TV Series Craze were now in Facebook! They already have a Fan Page in Facebook, the world's No. 1 Social networking Site! Are you already a fan of them?! Or that you already have them in your Pages' List in your profile? Well if not, kindly visit each sites by clicking the images below and press Become A Fan in the square box with a Facebook logo in the upper-right corner of each sites! Or, if you're already logged-in in your Facebook's account, kindly type each site's name (e.g. 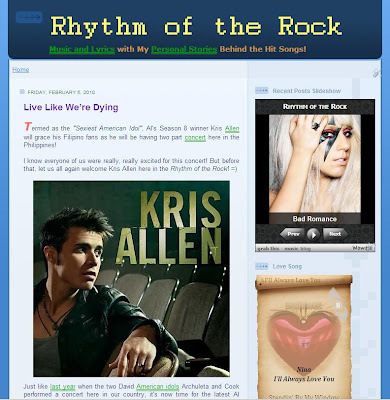 Rhythm of the Rock) in the Facebook's Search box then choose the sites you wanna join! Therefore, with the great success of these pages, I am now formally launching their Facebook's Fan Pages here in their mother site The Rock Land! So consider this post as a grand launching of Rhythm of the Rock, Rockz Cafe, and TV Series Craze' Fan Pages in Facebook! Oops, don't worry 'coz upcoming are the fan pages of this site The Rock Land as well as my other more blogs like TECHkyrocky and The Rock's Literary Collection! Level up ka na pare ah! Ilan na ba mga fans mo? Sensya na di pa ako nagpapa-member eh. Pag may time na lang. Hehehe!